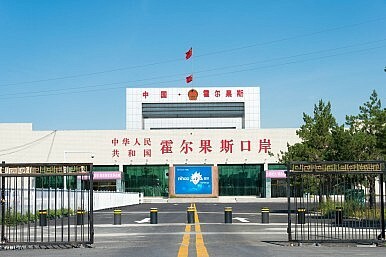 The China-Kazakhstan border crossing at Khorgos. Kazakhstan’s future is at a crossroads, with its relationship to China as the key. Most of the routes from China to Europe pass via Kazakhstan’s vast landmass, located strategically on the crossroads between Europe and Asia. As China is expanding its economic outreach to Europe, the government in Astana wants to benefit beyond transit fees as it is trying to break away from oil dependence. However, benefits might come at high cost, as Kazakhstan risks becoming too dependent on China economically and politically. Kazakh authorities have already launched several programs including “the 2050 Strategy” and ‘”the 100 concrete steps” that incorporate Chinese investments and goals for realignment with the Belt and Road Initiative. In effect, trade turnover between the two nations has surpassed $20 billion and keeps growing, turning China into Kazakhstan’s major strategic partner. Beijing has also already invested nearly $30 billion in the country’s mining, oil, transport, and agricultural sectors. These investments add to Astana’s own $9 billion stimulus plan for the nation’s modernization. Furthermore, Astana is also constructing “special economic zones” that include the Khorgos “dry port” on the Kazakh-Chinese border. Khorgos is anticipated to become one of the major cargo hubs of the new Silk Road. Officially announced by President Nursultan Nazarbayev in 2014, Khorgos should be operational in August. The construction is proceeding with DP World, a major UAE logistics company, which additionally highlights the involvement of the Arab investors. Khorgos’ capacity currently is 200,000 containers per year and is expected to reach 500,000 by 2020, which should total four million tons of cargo per year. Not surprisingly, China was the major supplier of funds; China’s Jiangsu province recently invested more than $600 million for developing the surrounding infrastructure in Kazakhstan. Astana is also hoping that by implementing such special economic zones it will be able to strengthen its leadership within Central Asia. In effect, Kyrgyzstan was recently alarmed by Khorgos, as it five times bigger than Bishkek’s Dordoi, previously the largest Central Asian market, and might redraw regional trade routes in favor of Astana. Thus, Kazakhstan’s goals of promoting its own influence thanks to Chinese funds is already delivering dividends. The railway that crosses the entire territory of Kazakhstan and reaches Iran is additionally expected to boost the country’s infrastructure. Cargo trains have already begun running from China to Iran via Kazakhstan and Astana is hoping to modernize its own available locomotives and repair 460 miles of rails. The project’s total cost comes out to $2.7 billion; by making the upgrade, Kazakhstan aims to capture 10 percent of the $600 billion trade volume between China and Europe. Kazakhstan is anticipating more economic dividends; meanwhile, it is also thinking about possible costs behind Chinese “help.” One of the world’s largest countries and currently transforming its economy, China’s strength will only keep growing in the years to come. China’s lack of a long-term policy toward Central Asia means Beijing might easily switch from securing economic interests to handling regional security issues in the future. Such a move might have far-reaching consequences for Astana’s independence. Moscow and Beijing have agreed to separate economic and security areas of influence within Central Asia, but everything might change in the long run. Beijing might use Kazakhstan as one of the bridgeheads for resolving ethnic tensions in China’s Xinjiang Uyghur Autonomous Region. The move might substantially disrupt the current balance of power, as Beijing’s involvement might diminish Russia’s influence and, henceforth, undermine Kazakhstan security, which is guaranteed by the Collective Security Treaty with the Kremlin. Therefore, many Kazakhs are experiencing reasonable fears about Chinese “help,” and those fears are turning into daily Sinophobia. For instance, recently Chinese firms were nearly allowed to rent land plots in the country, as changes were proposed to the National Land Code. The proposed legislation, however, sparked protests and even the resignation of the minister of agriculture and economy. According to the Eurasian Development Bank, only one in six Kazakhs perceives China as a “friendly nation.” In effect, Kazakhstan currently remains a nation on the crossroads, as it wants to extract economic benefits from China but fears the possible costs. Dmitriy Frolovskiy is a Moscow-based political analyst and writer. His writings have been featured by the Huffington Post, The Diplomat, Foreign Policy Association, Russian International Affairs Council, and others. Follow him on Twitter and Facebook.